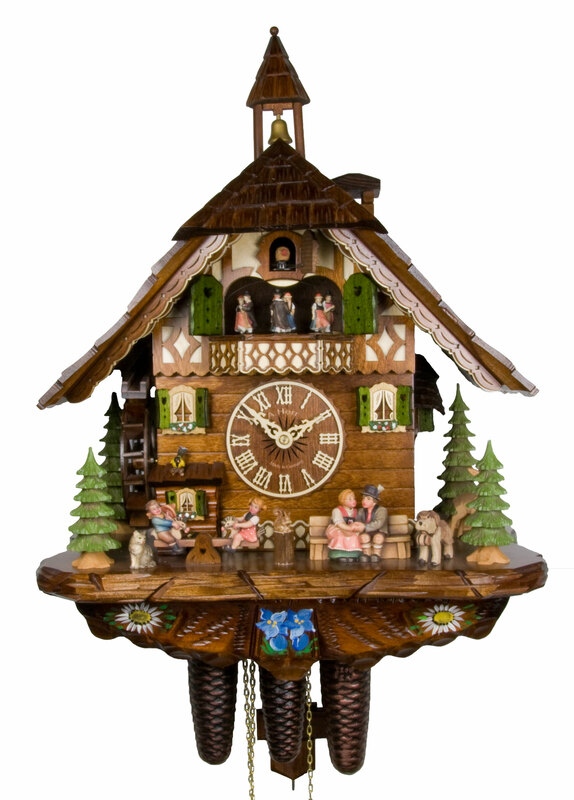 A cuckoo clock with a typical Black Forest House with a hand-carved roof, a bell tower, a chimney and hand-painted Gentian and Sunflowers. The parents kiss in time to the cuckoo call, which is once on the half hour and on the full hour according to the time. Two alternating melodies - Edelweiss and Happy Wanderer - play every hour. Meanwhile the siblings rock happily on the see-saw and the water wheel turns. The figurines on the balcony, who are wearing the Black Forest costume, dance around to the music. The clock is personally signed at the back by the manufacturer Adolf Herr. His signature guarantees the experience of 6 generations of clock-workmanship. This clock comes with a certificate of authenticity (AHC). Height: 21 Inches (53 cm), only clock case with bell tower, without weights and pendulum.